Recent breakthroughs have just let scientists and researchers tap into the hidden powers of 17 unique elements. The science to discover the true potential of these dynamic elements is only in its infancy. But already, it's becoming the driving force behind a brand new technical revolution. Some consider these elements to be a whole new investment class. Others call it a fad. But, temporary mania or not, prices of these technology metals are soaring. And investors are just now starting to see real profits. The elements I'm talking about are the rare earth elements. It's seldom you hear about them in the mainstream financial media. But rare earth elements (REEs) are a vital component in most of the technology we use every single day. The automobile industry alone uses tens of thousands of tons of rare earth elements each year in the manufacturing of catalytic converters. Meanwhile, the U.S. government has recently become very interested in REEs for advanced military technologies such as missile guidence systems. As the demand for newer, faster, and better technologies will no doubt continue to rise in the future, so too will demand for the raw rare earth materials needed to create them. But there's a slight problem. And it isn't that these elements are necessarily "rare". The trouble is, approximately 95% of the global supply of rare earth elements comes from just one country: China. And because the country needs these vital metals to maintain its positon as the world's leading exporter, China might be preparing to stop exporting these strategic elements altogether. Over the last eight years, China has reduced the amount of rare earths available for export by nearly 50%. Some suggest they'll simply cut off all supply by 2012. Industry sources have told The Independent that China could halt shipments of at least two metals as early as next year, and that by 2012 it is likely to be producing only enough REE ore to satisfy its own booming domestic demand, creating a potential crisis as Western countries rush to find alternative supplies, and companies open new mines in locations from South Africa to Greenland to satisfy international demand. China pulled back global rare earth exports by 72% during the second half of last year. And in the first six months of 2011, rare earth elements from China have dropped another 35%. These cutbacks have sent rare earth element prices soaring higher. The price of europium oxide – used in florescent light bulbs, TVs, and smartphones – has nearly tripled from $35 an ounce to $96 an ounce in the past three weeks alone. Meanwhile, dysprosium oxide – used in magnets, wind turbines, and computer hard drives – has more than doubled from $20 to $42 an ounce. Molycorp owns the world’s largest, most fully-developed rare earth project outside of China. Shares of MCP have run up over 300% since the company went public in August 2010. While companies with rare earth assets continue to perform well and draw new investment attention, there's a new way to invest in rare earth elements that has everyone talking: Rare Earth Bullion. After doing a bit a research, I've found two companies that sell rare earth bullion to the retail market. The first one, Metallium, Inc. (www.elementsales.com), is geared more to collectors, schools and universities, researchers, and jewelers. However, London-based Rare Earth Bullion (www.rareearthbullion.com) is targeting investors. 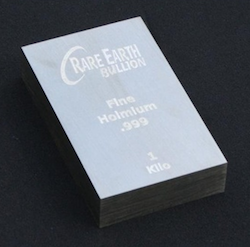 Rare Earth Bullion is a brand new company that offers certified .999 pure metal rare earth bullion bars. The company doesn't sell all 17 elements, but rather focuses on investments in eight of the “heavy” rare earth elements, a subcategory of the rare earths that are in highest demand. *including taxes and based on Rare Earth Bullion's current price for 100 gram bars. Buying larger bars is cheaper overall. Metal prices change daily, as do conversion rates between the British Pound and US Dollar. The prices listed above are simply to give US investors an idea of rare earth prices compared to current gold and silver prices, which are $1,525/oz and $35.25/oz respectively. We firmly believe rare earth metals will outperform precious metals going forward. They have the same benefits as precious metals being that they are a physical commodity with finite supply. Unlike gold and silver they do not have monetary status. Much like precious metals they will rise in price with inflation (like most commodities) and also appreciate in value as the US Dollar weakens. Before you go off betting the farm on ytterbium, dysprosium, or any of the other impossibly pronounced metals, there's one major factor to consider: Liquidity. The rare earth element market is as illiquid as the market for Pat Boone vinyl records. It's dry. 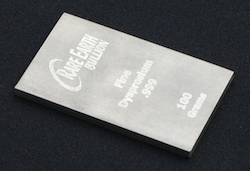 Buying rare earth bullion is as easy as ordering anything else over the Internet. But finding another interested investor to sell it to when it comes time to turn a profit is another thing entirely. In fact, unlike most precious metal bullion dealers, even Rare Earth Bullion won't buy your metal back. The company says it has plans to develop a buy-back mechanism in the future. However, at present, you'd have to find another private investor to sell your rare earth bullion to. So, if you're going to invest in a physical metal, I still recommend going with gold or silver for now. But that doesn't mean you can't – or shouldn't – take advantage of soaring REE prices. You've already seen rare earth equities like MolyCorp return a 300% gain and Quest Rare Minerals yield a 200% profit in under 12 months. But if you're looking for an easy way to get general exposure to rare earth elements, there's an ETF. The Market Vectors Rare Earth/Strategic Metals ETF (NYSE: REMX) is a composite of 28 international rare earth companies. This ETF has performed okay, returning 28% since its inception in late October 2010, although not as well as individual stocks like MCP or QRM. With global supplies dwindling from continued reduction in Chinese exports, rare earth elements offer quite an attractive risk/reward potential. But I recommend investors to shy away from investing in physical rare earth metals at this point. Investing in rare earth stocks is way easier, and often way more profitable in the end anyway.